Did you know that digging in the dirt is good for your health? Gardening is a life-giving giving hobby that has a broad range of physical and mental benefits. It’s no surprise that the use of horticultural therapy to treat medical conditions is growing in popularity. Gardening activities are widely used to help people cope with anxiety and depression in addition to improving physical health. Gardening is also a versatile hobby that can be enjoyed by young and old alike. 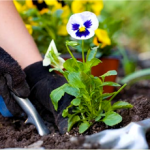 Most people can participate in a gardening activity at some level. Having kids plant seeds in a pot and watch them grow is easy, fun and educational. Container gardening is also an easy activity that people of all ages can enjoy. Gardening workshops are surfacing all over, even in bars and restaurants. Gardening is a worthwhile hobby to pursue, especially considering all of its health benefits. Reduce the risk of major illnesses such as heart disease, stroke and diabetes by providing moderate exercise. Boost immunity by exposing you to “friendly” soil bacteria (Mycobacterium vaccae) which has been found to alleviate symptoms of allergies and asthma. Promote weight loss since it provides a great whole body workout that feels more like fun than exercise. Gardeners have a significantly lower body mass index and less chance of obesity. Improve fine and gross motor skills and improve hand-eye coordination. This is especially important for seniors since they have diminishing dexterity and strength in their hands. Improve self-esteem – it gives the opportunity to learn and accomplish tasks. Gardening gives personal satisfaction by allowing you to work on a project, however small. Encourage socialization – local gardening clubs and community gardening projects encourage fellowship and teamwork. Gardening activities help draw people out that are isolated and need companionship. Spark creativity – gardening challenges the mind to solve problems and be creative. You need to decide what to plant and where. Improve brain health – people that garden have a reduced risk of developing dementia later in life. Stimulate the senses – gardening gives a chance to connect with nature and interact with the environment. Plants are great to look at, touch and smell. Provide stress relief – caring for plants gives pleasure and reduces stress. Research has shown that gardening lowers cortisol (stress hormone) levels. Due to its widespread benefits, gardening is an activity that is being used for interactive health and healing. Gardens are popping up in prisons, hospitals, nursing homes, and in community centers for the homeless and at-risk youth. Spending time in the garden provides a sanctuary from stressful living and generally helps people feel better. So, what are you waiting for? It’s time to get outside and dig in the dirt!